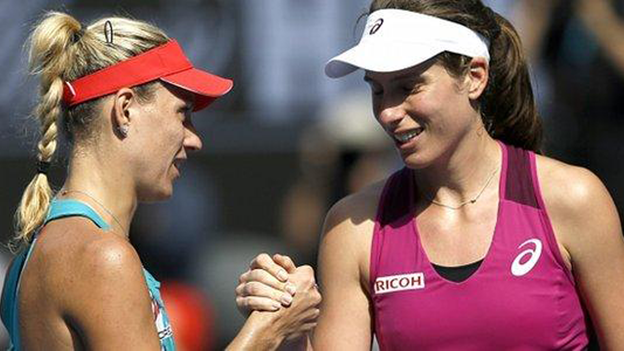 Johanna Konta's superb Australian Open run came to an end with defeat by German seventh seed Angelique Kerber in the semi-finals. Konta, the first British woman for 33 years to play in a Grand Slam semi-final, went down 7-5 6-2 in Melbourne. "I played against a better player today who earned her right to a Grand Slam final," said the British number one. The 24-year-old collects £370,000 in prize money, while her ranking is set to jump from 47 to inside the top 30. Kerber goes on to face world number one Serena Williams, who took just 64 minutes to thrash Polish fourth seed Agnieszka Radwanska 6-0 6-4. The American, 34, is the defending champion and is chasing a seventh Australian Open and 22nd Grand Slam title. The Briton made a nervous start and could not stem a flow of errors that kept the pressure off Kerber. Konta ended the match with 36 unforced errors to the German's 11, having dropped serve five times over an hour and 22 minutes. She looked every bit the debutante at this level as she slipped 3-0 down, with Kerber - twice a Grand Slam semi-finalist - hardly required to do anything but keep the ball in play in the early stages. There was real hope for Konta when she found some rhythm and clawed her way back to lead 5-4 in the first set, but Kerber broke again at 5-5 and would lose just two more games. Konta was staying upbeat after her loss, insisting: "I don't think I missed an opportunity." She felt Kerber simply played better, adding there were a lot of positives to take from her straight-sets defeat. "I'm really hungry to keep improving and keep enjoying what I'm doing," she said. "So that's where I'm at. "I just will go back, keep working hard, keep improving the things that I want to improve and keep enjoying what I'm doing." Konta's progress over the last 12 months has been described as "phenomenal" by GB Davis Cup captain Leon Smith. "Jo should be so proud of herself, the way she's played and handled herself," he told BBC Radio 5 Live. "Yes, she'll be disappointed today, but she probably can't wait to get going again." Jo Durie, Britain's last female Grand Slam semi-finalist, and former British number one Greg Rusedski both tweeted praise for Konta. Rusedski, who reached the US Open final in 1997,wrote: "Great run for @JoKonta91 getting to the semifinals of a GS for the first time. Now into the top 30 in the world. She will only get better." Johanna Konta says she has learnt to 'feel comfortable being uncomfortable' during her run to the semi-final. The experience of winning five Grand Slam matches in a row and working through some stressful periods will stand her in great stead. She will be 28 in the world when the rankings are updated on Monday and has very few points to defend until the grass-court season begins in June, so she has an excellent chance of being seeded for both the French Open and Wimbledon. She has also earned the right to play in any tournament she chooses to, anywhere in the world. It has been a phenomenal performance by a player, who before her run to the fourth round of the US Open last September, had only ever won one match in a Grand Slam main draw.